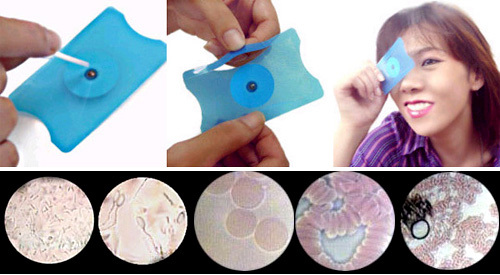 Disposable Microscope Cards Will One Day Be Necessary For Using Cellphones | OhGizmo! Once again the credit card becomes the size standard to which anything miniature gets compared. If you can squeeze it down to fit in a credit card slot, then you’ve done your job. (Back to the drawing board Apple.) And apparently the latest bit of tech to get the card treatment is the microscope. These disposable cards (which come in packs of 5) include a small lens that can magnify a sample from anywhere between 500x to 1000x depending on how close you hold it to your eye, and the available light. The site suggests using them for checking hair for dryness, or even performing your own blood cell counts. So clearly the target demographic for these cards is the booming hypochondriac market. You can find the 5 pack available at Japan Trend Shop for $89, and oddly enough they include this item under the ‘Beauty’ section of their online store. What and odd product. I didn’t know people were looking for disposable microscopes.